This term our three youngest will be focusing on the Core Value of Integrity at school. I think it can be defined in a lot of different ways and am really looking forward to our teatime round-the-table discussions as we get further into their learning. I would like to think I am a person of integrity in all aspects of my life so should have some wisdom to impart! Reblogged this on The healthy rawr chic. 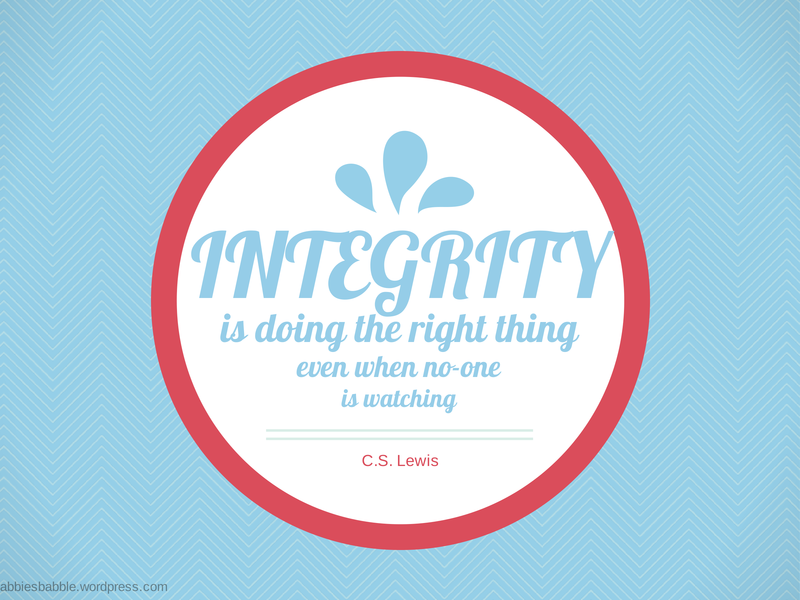 Nowadays, though it is one of the basic core values, we notice integrity getting compromised on numerous occasions. It’s wonderful to hear schools dedicating a whole term to Integrity.Keep us posted about your teatime discussions with your little one. Special Character school ..never heard of it in this part of the world. would love to know more. My son’s school is very open to parent suggestions and ideas. I’ll like to pitch the idea of incorporating core values in their term curriculum. 🙂 What a wonderful idea !! By being ‘special character’ it is allowed to be state-integrated instead of fully state funded. Which is a fancy way of saying we are a christian school which receives some government funding but parents also pay additional fees. Then the school can direct its own curriculum a little more. While also meeting national requirements. Well that’s my understanding anyway! In each of the four terms we have a devotional theme (e.g. God is Creator) and a core value (e.g. Integrity) which are woven into the everyday learning. Abbie – love the idea of kids being taught in this way! Thanks for explaining Abbie. You’ve got me excited..imagine little minds focusing on a single core value for a quarter of a year – reading, doing activities, discussing. They’ll sure understand and imbibe it very well. Great blog btw – looking forward to reading more from you. You re right – I think a lot of values in general have been misplaced in society. I’m a little old fashioned though – honesty, integrity, respect, kindness and loyalty are so important and I make a point of finding ways to actively show these to my kids. We’re so lucky with our school too! Thanks for comment on my blog, I’ve been over at your place too. Awesome! I totally relate to you… old fashion values are the way forward! We need to bring them back! I also try to make a point about these issues with my kids also. It’s difficult in this day and age (God I sound so old lol) to bring children up and instil these values in them. I just hope they stay with them as they get older. Thanks so much for visiting my blog – much appreciated. I love the style of your blog!